Posted by Ben Jardine on 18 October. Since 2012, One Percent Collective has been helping support New Zealand’s charities by empowering people to donate as little as 1% of their total income in a single payment. With over 500 regular donors, the Wellington-based nonprofit is about to hit the $1M milestone for money raised for Kiwi charities, ranging from Kaibosh to Sustainable Coastlines (to name just a few). 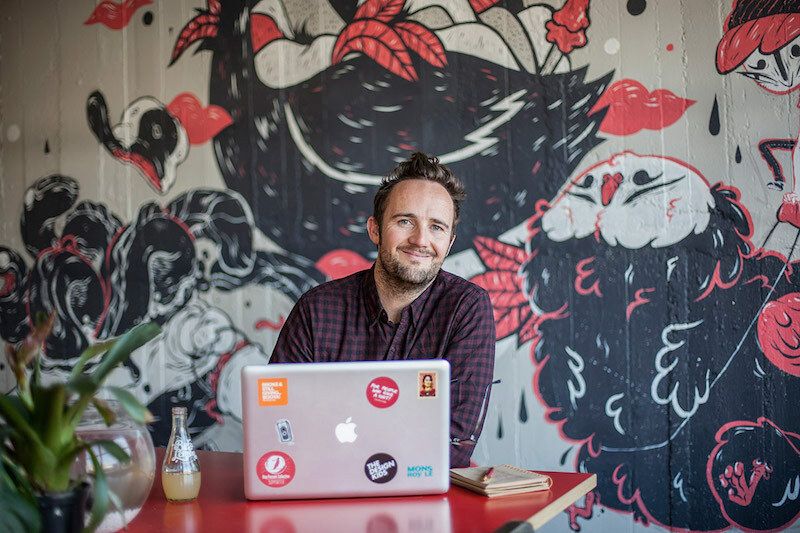 We chatted to founder and Chief Doer of Things, Pat Shepherd, about setting up One Percent Collective and how he sees the “giving landscape” changing in the coming years. What was the original idea behind One Percent Collective and how are you engaging more people to make charitable donations? The original idea was to simplify the way we give to causes we care about. Rather than making one-off donations now and then, we wanted to inspire people to give on the regular, so that small charities can really plan ahead better, thus being able to have more impact on the areas they are working on. We were also seeing our friends not enjoying the fundraising methods many of the larger charities use so we wanted to create a different model, with storytelling, events, and a real human approach to giving being at the heart of everything we do. How is One Percent Collective making it easier for people to make charitable donations? First up we focused on the user experience, so we designed our setup process to take around 3 minutes. The donor is always in control of how much, how often, and which of our partner charities they share their donations with. Then we looked at how to share the great news from our organisations through storytelling and events. At the end of each year, we simplified things with one annual summary donation receipt, rather than bits of paper each month that just get lost. All of this makes life easier for our donors, our charities, and us. Many self-employed people don’t often consider making charitable donations. Permanent staff have the option of Payroll Giving, but there isn’t really an equivalent for the self-employed. Is this something you’ve seen change over time? In New Zealand, Payroll Giving still hasn’t really taken off: only around 1% of our donors give via Payroll Giving. We have had a number of self-employed people who want to give their 1% but with fluctuating income, they have found it hard to commit. We work with them by saying “tell us your charities, pop our info into your online banking and anytime you want to donate, just transfer the amount you want – we’ll take care of the rest”. This has made it much easier for people to give as and when they want to. There’s more info on this way of giving here. What role do technological changes and innovations (eg digital donations) play in enabling more people to give to charities? There are a number of ways to give and it’s only going to get bigger in terms of options, with crypto, Apple Pay, and others all being methods that will start to have an impact. I personally think no matter how many methods there are, the biggest challenge first off is to inspire people to take action. For us, regular giving really is key: this is how the charities can really plan their impact, so it’s what we’ve chosen to focus our attention on, plus with 98% of our donors giving via online banking, it shows that at present it’s the most popular way for us. What sorts of tax relief can self-employed people get when they make charitable donations? When you donate to a registered NZ charity with donee status, you can claim up to a third of your donation back at the end of the tax year. This is huge because if you donated $600 you would get $200 back. That way you can use it to treat yourself or give it back to charity. Way too many people forget to claim it which is crazy, as it just means it stays with the IRD instead. What’s the one thing you’d like to see change about the way that Kiwis plan around charitable giving? I really would love to see giving 1% as the norm for all those that can afford it. Many of us live very lucky lives and the least we can do is donate 1% of our income to help those that need our support. I often remind people that we still get to keep the other 99%, so 1% really is an easy way to plan your charitable giving. For the average Kiwi, it’s around $10 a week. What sorts of things do you hope to see in the future when it comes to charitable donations? I’d love to see businesses really inspiring their staff more around giving. Some set up Payroll Giving systems but don’t even tell their staff it’s an option, which is crazy. Imagine if every new hire was given an option to tick the box when they started so that they could simply give a % out of each paycheck. It keeps their life easy, they barely notice it and charities get to do what they do best which is to support the community. What sorts of trends are you seeing in New Zealand in regard to charitable giving?